A U.S. soldier on an M113 armored vehicle participates in the Warrior Strike viii exercise on Sept. 19, 2017, in Pocheon, South Korea. If America pulls its troops out of South Korea, it will leave a power vacuum that could be filled by Russia and China. The United States and South Korea are struggling to reach an agreement on the cost of maintaining U.S. troops in South Korea, a South Korean lawmaker said on January 22. Disputes between the two governments could lead to the complete removal of U.S. troops from the East Asian nation. A five-year deal on cost-sharing between the two expired at the end of 2018. Despite 10 attempts to negotiate a deal, the U.S. and South Korea have yet to finalize a deal to fund U.S. troops in the nation. In August 2018, U.S. President Donald Trump complained that America was “subsidizing” U.S. troops in South Korea, Japan and Saudi Arabia. 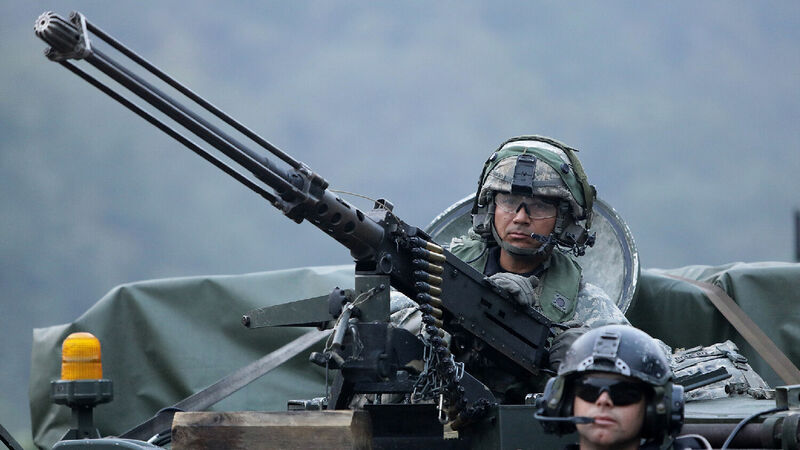 The U.S. pays for “about 60 percent” of military costs in South Korea. “When you have wealthy countries like Saudi Arabia, like Japan, like South Korea, why are we subsidizing their military?” the president asked. The U.S. has maintained a military presence in South Korea since the Korean War hostilities ended in 1953. The 28,500 U.S. troops stationed there are vital to the security of the Korean Peninsula and America’s strategy to stabilize Asia. America’s presence in South Korea has served as a major deterrent to North Korea. The dispute on military cost-sharing is a sign that the alliance is fracturing. The U.S. pulling its troops out of South Korea is now a possibility. “Such a split [between the U.S. and South Korea] would see America’s 28,000 troops stationed in South Korea ousted, and would shift a huge amount of political and military influence away from the U.S. and toward Asia’s regional behemoths,” the Trumpet wrote in October. The Trumpet and its predecessor, the Plain Truth, have forecast for almost 70 years that America’s power and influence in Asia and in the world will dwindle. Many trends, including the disagreement between the U.S. and South Korea regarding cost-sharing of U.S. troops, bring this forecast closer to reality. This forecast takes on more clarity when viewed through the lens of Bible prophecy. Unless or until the United States as a whole repents and returns to what has become a hollow slogan on its dollars: ‘In God we trust,’ the United States of America has won its last war! I said that when we failed to win in Korea! … I say it again, now that the United States government endorsed this Cuban fiasco—its president gave the “go ahead”—and God, the God America has deserted, gave its most humiliating defeat! What does the Cuban debacle mean? It means, Mr. and Mrs. United States, that the handwriting is on your wall! Mr. Armstrong’s forecast of diminishing American power is based on Bible prophecy. In Leviticus 26, God outlines the blessings ancient Israel and its descendants would receive if they obeyed God and curses if they disobeyed. Verse 19 states that God will break the pride of Israel’s power. One of the nations descended from ancient Israel today is America. (For proof, request your free copy of Mr. Armstrong’s book The United States and Britain in Prophecy.) A quick look at America’s wartime history after World War ii shows that God has indeed broken the pride of America’s power. If the U.S. pulls its troops out of the Korean Peninsula, nearby powers like Russia and China could take advantage of the situation, pressure South Korea to reconcile with North Korea, and form a military alliance between the Koreas. This would fit into the general scheme of Bible prophecy. When you put India and Japan together with Russia and China, it is easy to see how an army of 200 million soldiers could be formed. With other Asian nations [like South Korea] joining in, you quickly reach combined populations of 3.5 to 4 billion people! Under extreme circumstances like those described in these end-time prophecies, it is not hard to imagine 1 in 10 or 20 people going to war. With South Korea’s relatively advanced military, we could see it lend its military power to an alliance with Russia, China and other Asian nations. To understand more about how Bible prophecy forecasts the formation of “the kings of the east” alliance, which could include South Korea, please read He Was Right and The Prophesied ‘Prince of Russia,’ by Mr. Flurry.